If you are having an impromptu get together, a snack mix is never a bad idea. These three quick and easy snack mix recipes are inspired by holiday flavors like cinnamon, peppermint and chocolate. Whether you and your guests prefer something intensely sweet, spicy, or mild - there a snack mix to please all palettes. 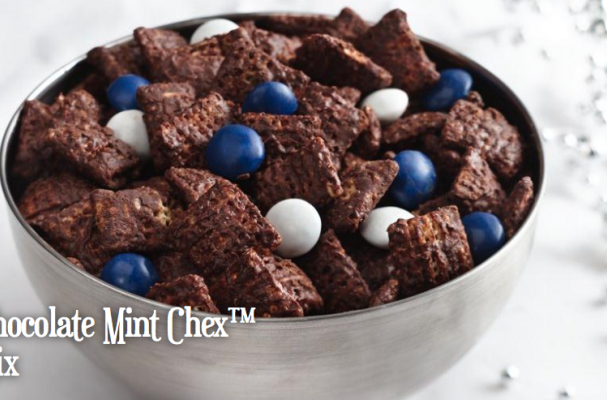 Check out the homemade snack mixes below and feel free to add your own spin. Step 1: In large bowl, mix cereals and almonds. Line cookie sheet with waxed paper or foil. Step 2: In 2-cup measure, beat egg white with fork. Mix sugar, salt and spices together in small bowl. Pour egg white over cereal; sprinkle with sugar-spice mixture. Step 3: Microwave on High 3 to 4 minutes, stirring after every minute until cereal and nuts are browned and sound crisp when stirred with spoon. Pour onto waxed paper to cool. Store tightly covered. Step 1: In large microwavable bowl, measure cereals; set aside. Step 2: In 2-cup microwavable measuring cup, microwave butter until melted, about 45 seconds. Stir in brown sugar and juice concentrate; microwave 30 seconds longer or until mixture is boiling. Pour over cereals, stirring until evenly coated. Step 3: Microwave uncovered on High about 3 minutes, stirring every minute, until mixture is glazed. Stir in almonds and apple chips. Spread on waxed paper to cool. Store in airtight container. Step 1: In large microwavable bowl, measure cereal. Set aside. Line cookie sheet with waxed paper. Step 2: In medium microwavable bowl, microwave mint chips uncovered on Medium (50%) about 1 minute, stir. Microwave an additional 15 seconds at a time, until chocolate is mostly melted and can be stirred smooth. Pour over cereal, evenly coating pieces. Step 3: Microwave uncovered on High 3 minutes, stirring every minute. Spread on waxed paper; cool 5 minutes. Stir in candies. Store tightly covered.